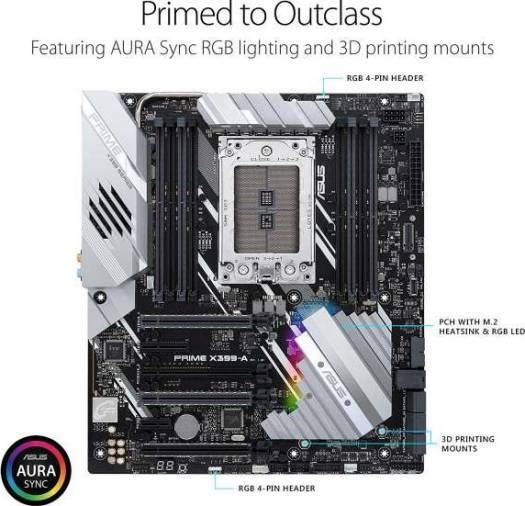 The ASUS PRIME X399-A is the prime choice for prosumers and content creators featuring 1-click overclocking with 5-Way Optimization, ASUS Pro Clock Technology, and multiple GPU support with SafeSlot protection. 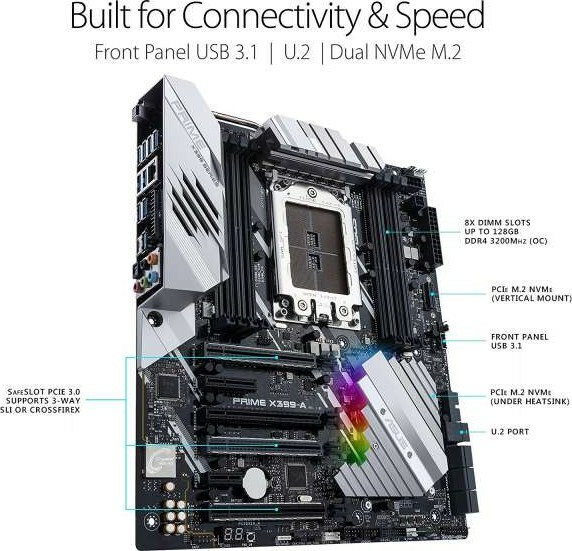 Dual M.2 and front-panel USB 3.1 deliver optimized data speeds, while AURA Sync lighting and 3D-printing mounts provide unlimited personalization. One-click overclock and cooling, done. One click takes care of all that complex tuning. ASUS 5-Way Optimization makes your PC smart. It dynamically optimizes essential aspects of the system, providing overclocking and cooling profiles that are tailored for your rig. Fans stay whisper-quiet for everyday computing, and deliver optimal airflow when the system is crunching through CPU or GPU-intensive tasks. Lastly, an all-new stress test that allows users to optimize and overclock for CPU or memory-centric workloads. Speed up with onboard dual M.2 up to 32Gbps and keep your SSD cooler with an ultra-efficient heatsink. 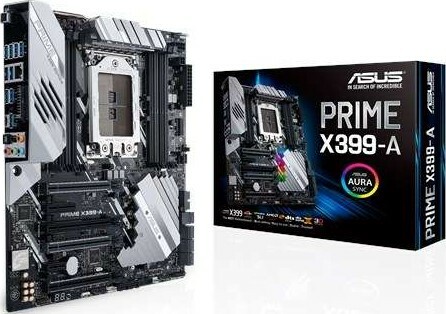 Future-proof connectivity with the Prime X399-A's front panel USB 3.1, ready for next-gen PC cases and devices. Lastly, with the U.2 connector, experience fast data-transfer speeds and free up a PCIe slot for another expansion card. ASUS Aura offers full RGB lighting control with a variety of functional presets for the built-in RGB LEDs as well as strips connected to the onboard RGB headers. And it can all be synced with an ever-growing portfolio of Aura-capable ASUS hardware. Prime X399-A also includes 2 onboard RGB headers ready to sync lighting effects with different Aura Sync compatible products. 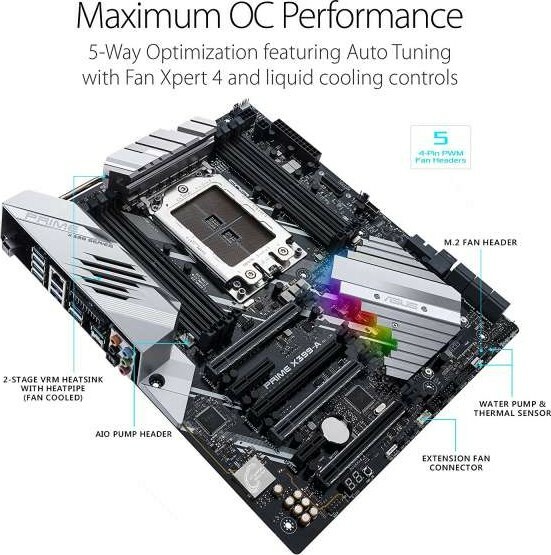 We offer express delivery to Dubai, Abu Dhabi, Al Ain, Sharjah, Ajman, Ras Al Khaimah, Fujairah, Umm Al Quwain, UAE for ASUS PRIME X399-A AMD SocketTR4 EATX Motherboard with M.2 Heatsink, DDR4 3600MHz, Dual M.2, U.2, SATA 6Gb/s, Front-panel USB 3.1 Gen 2 connector | 90MB0V80-M0EAY0. 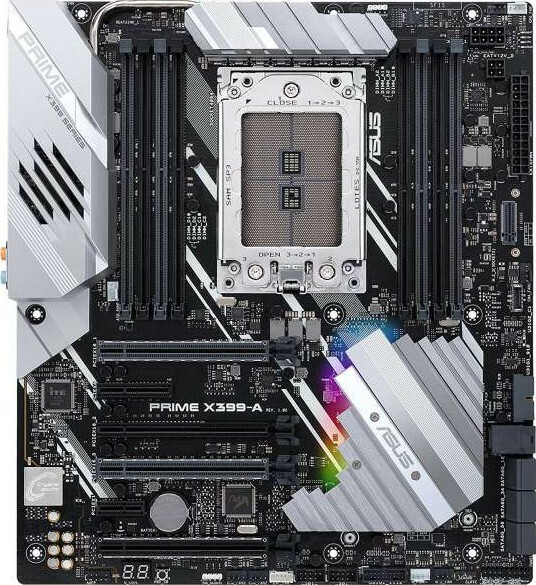 We offer the best price for ASUS PRIME X399-A AMD SocketTR4 EATX Motherboard with M.2 Heatsink, DDR4 3600MHz, Dual M.2, U.2, SATA 6Gb/s, Front-panel USB 3.1 Gen 2 connector | 90MB0V80-M0EAY0 in Dubai, UAE. Buy now with the best price!